Rudbeckia is a genus made up of 23 species, commonly known as Black-eyed Susans. Brown-eyed Susans, or Gloriosa Daisy (annual). Rudbeckia may be annuals, biennials or perennials, all of which are native to the meadowlands and woodlands of North America. Rudbeckia blooms are typically daisy like flowers, sometimes with slightly reflexed (drooping) petals and a prominent cone (center). The flower petals of the Rudbeckia are often some shade of yellow with dark or black contrasting centers. (Note: Purple Coneflower is an Echinacea purpurea. Echinacea and Rudbecia are two entirely different genus. Coneflower are Rudbeckia genus). Rudbeckia triloba are easy to grow, virtually pest free and wonderful in fresh flower arrangements. Rudbeckia are an excellent perennial for sunny gardens but will bloom fairly well in part shade. Although they prefer a moderately fertile soil they are tolerant of clay also. They are very tolerant of heat and humidity, but prefer some supplemental water in periods of extended drought. Blooming will also be improved when supplied with adequate water. In the hotter regions Rudbeckia coneflower will appreciate some afternoon sun and are quite happy with part shade. Coneflower self seeds quite readily and is considered invasive by some. Diligent deadhead will prevent self seeding and will also encourage additional blooming. If you prefer to leave the last blooms of autumn to go to seed, you will enjoy not only interesting seed cones through winter but also the birds that enjoy the seeds. Plant can also be propagated by division. Rudbeckia plants that become taller or bushier than desired can be cut back to about 6" to generate fresh growth. 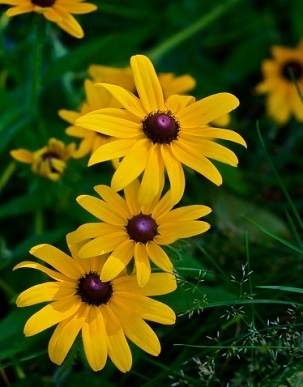 Rudbeckia triloba are the true Brown-eyed Susan that has less hairy foliage than hirta. Also referred to as thin-leaved coneflower or three-lobed Rudbeckia, triloba is well branched with slightly hairy stems. Rudbeckia triloba flower petals are slightly shorter and of smaller quantity than R. hirta. These Brown-eyed Susans typically perform as a biennial and will self sow. Soil Requirements: Average, well drained, prefers organically rich moist soil id adaptable. Growth Habit: Clump forming, well branched. Pest and Disease Resistance: No problems of note, somewhat susceptible to powdery mildew. Fertilize: Work a slow release balanced fertilizer into the soil before planting, or apply a water soluble fertilizer every few weeks. Maintenance: Deadhead to encourage blooming and to minimize self seeding. Cut back to the ground in late winter, wait for spring to allow seeding. Other: Attracts butterflies and birds. Rudbeckia triloba produces 1 1/2" daisy like flowers in golden yellow, blooming profusely from summer right up to hard frost. Up to 12 petals are contrasted with a deep brown-purple center disk. Brown-eyed Susan is a short lived perennial but can be considered a biennial. It self seeds readily, which can be minimized by deadheading spent blooms. Although this Rudbeckia is short lived it will perpetuate by seed and can be naturalized easily. Flowers left on the plant will attract birds as the seeds develop. Brown-eyed Susan is pretty tolerant of shot drought periods and heat, but will prefer to receive supplemental water in extended dry periods. Full Sun is ideal for Brown-eyed Susan, especially in the northern regions. In the hot southern regions afternoon shade will benefit the plant. Some shade is tolerated fairly wee, but when grown in too much shade the flowering will be reduced and the stems may be weak, required staking. In ideal conditios Rudbeckia triloba can grow as tall as 5 feet, and given room to spread the well branched plant can become quite bushy. The Brown-eyed Susan blooms more heaily than Black-eyed Susan but with smaller flowers that have fewer petal rays. Brown-eyed Susan are native to much of the eastern and central United States. Excellent as cut flowers and companion to grasses and a variety of perennials. Ideal in carefree cottage gardens.